If there are 4 or more participants in one age category in a given race, there will be gold, silver and bronze medals. If there are 3 or few participants in one age category in a given race, there will only be a gold medal for the winner of that age category in that race. How does that work in practice? 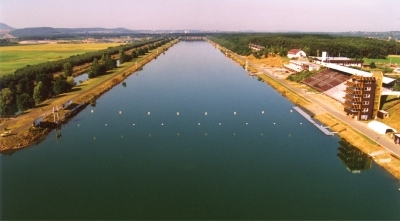 Take for example the men’s single sculls in the A-C categories. There were 9 entries in the A category, 6 in B, and 12 in C. Easy. There are two races for A,with 4 and 5 participants, then a full field in B, and 2 races with a full field in C. As the bow number in your category is random, with 12 entries in C it was interesting to see who I would race against. It ended up with a “strong” race and a “weak” race (all on paper), and I was in the “strong” one with fast rowers. More difficult was the ladies 2x, which ended up with a combined B/C race with three participants of each category and a gold medal handed out to the fastest B as well as the fastest C. You have to study this before you appear at the start, because you may get a medal even when you finish third. 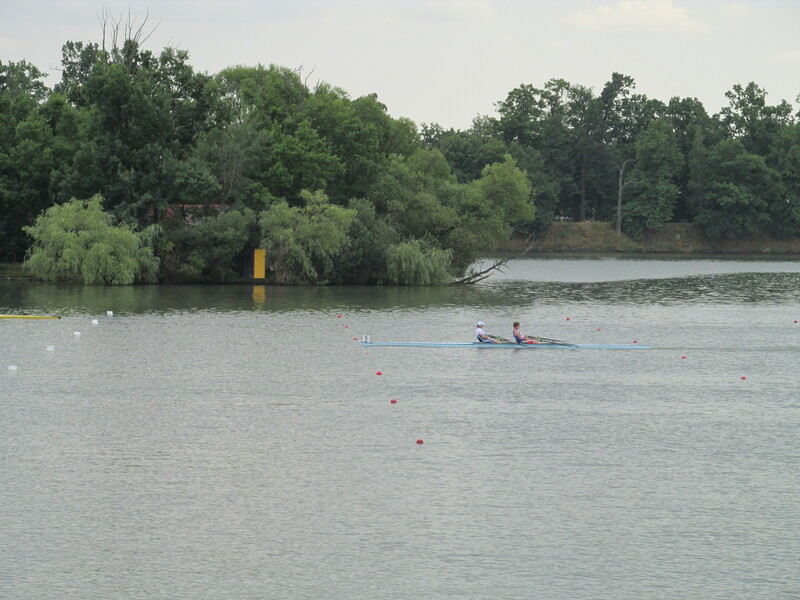 I watched Romana win a bronze medal in the mixed eight (yay! ), and then I headed back to my hotel room for some relaxation. My race was scheduled for 11:40 AM. 11:40 time for my single race. Full field of 6 entrants. Absolute favorite was Petr Mitas on lane 2, with me placed second on paper in lane 3, but one should not forget Vladimir Milota over on lane 6. Dekanovsky and Brazda should not be underestimated as well. Suffice to say I was very nervous. My race plan was to start fast, then do series of 10 strokes intervals rotating my focus between strong tap-down, not digging too deep, back swing, and back. As 500m I would assess my position in the field. If necessary to secure a medal position, I would do a set of ten strokes at 500m to go, and of course a strong last 250m if needed. Most probably Mitas would lead, and if I would challenge him would depend on how far he would be ahead of me. Hopefully I would not have to play catch-up. The conditions were good. Slight cross wind. Air temperature 32C (very sunny and hot). Mirror flat water. I had a good start and did 10 very strong strokes immediately after that, then settling into my introspective technique focused rotation of sets of 10 strokes. Of course I noticed that Mitas was half a length ahead and I was in a line with the others. 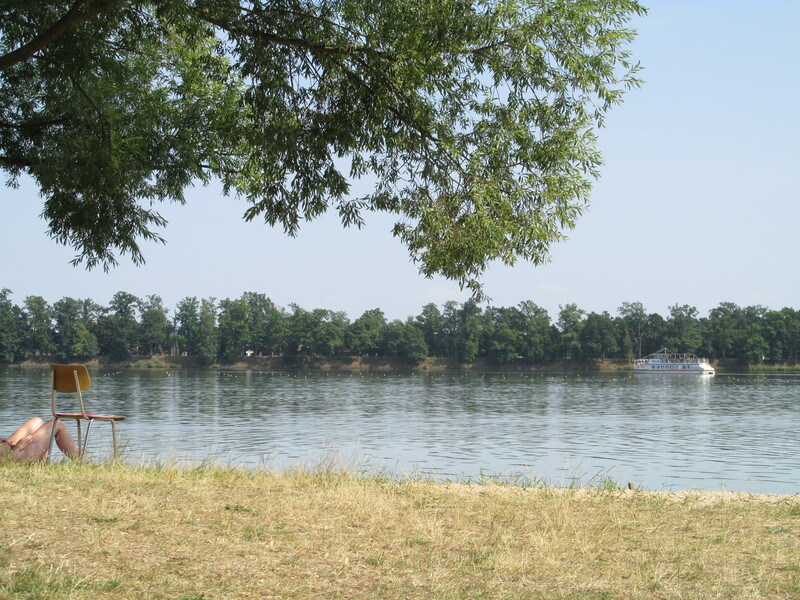 Fortunately, I started pulling away from the pack and after 200m I was rowing in a clear second position, one length ahead of Milota, with the three other rowers falling behind. When I was through counting my sets and arrived at the 500m mark, Mitas was 2 lengths ahead of me, Milota was a length and a half behind me, and the rest was far enough behind to not be a threat. I skipped the 500m intermediate sprint and started to watch Milota. Mitas was too far ahead. The only way to catch him was to row constant pace and hope that he would fly and die. Mitas didn’t die. He won. I came second, but I did have to do some work to counter Milota’s attempts to get closer to me. I was really happy with the result, and with the time. 3:38 rowed in a crosswind, I consider that my fastest race of this season so far. I have clocked faster times in the Hodonin and Slovakia Nationals but Hodonin is on a fast flowing river and Slovakia was with tailwind. Good to see the stroke rates. During the race, there was too much sun to see anything on the iphone, so I ignored it and just focused on good rowing. Happy to see that I sustained a 32spm stroke rate and higher. 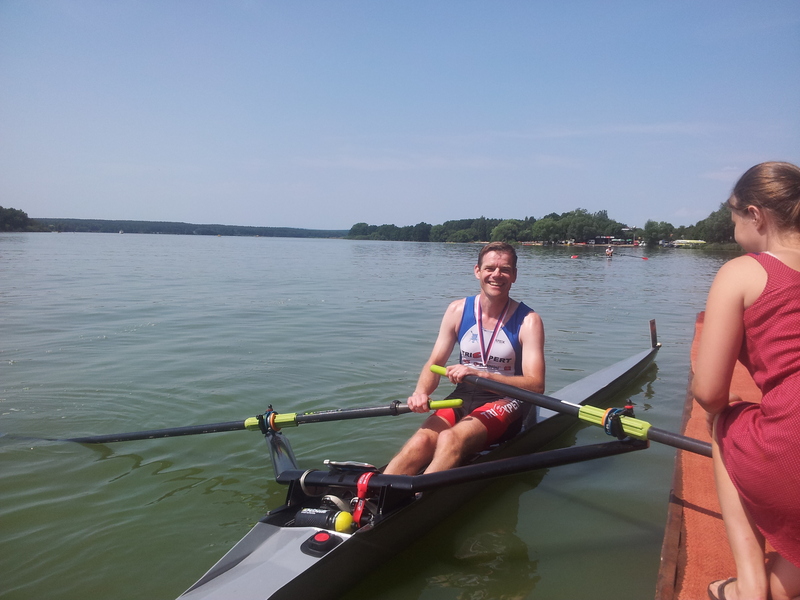 After the race, Petr Mitas told me his ambition is to row a 3:25 time this year in Hazewinkel. I wish him good luck but I hope my race will be without him. Then it was time to relax, recover, and prepare for the quad race. I spent my time sitting under a tree watching the racing, eating high energy food (apple, dried fruit, energy bar, and something that I call “bird food”). It wouldn’t have made sense to go for a full out lunch. I would be asleep by the time I would have to stroke the quad at 2:40pm, three hours after the single. Notice the medals around their necks. The quad race was a full field, 6 entries in the B category. Difficult to predict the result. We had won a year ago, but we had a less experienced sculler this year. Each of the other boats had a few good rowers and a few unknowns. We launched 25 minutes before the race in bright sunshine and rowed towards the start. 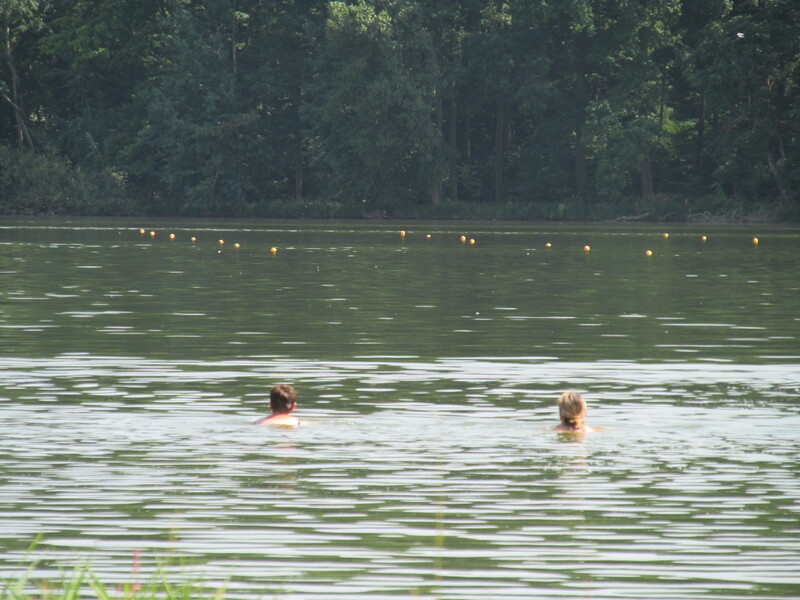 We did a few practice starts in the upper part of the lake, seeing a thunderstorm appearing from the south. 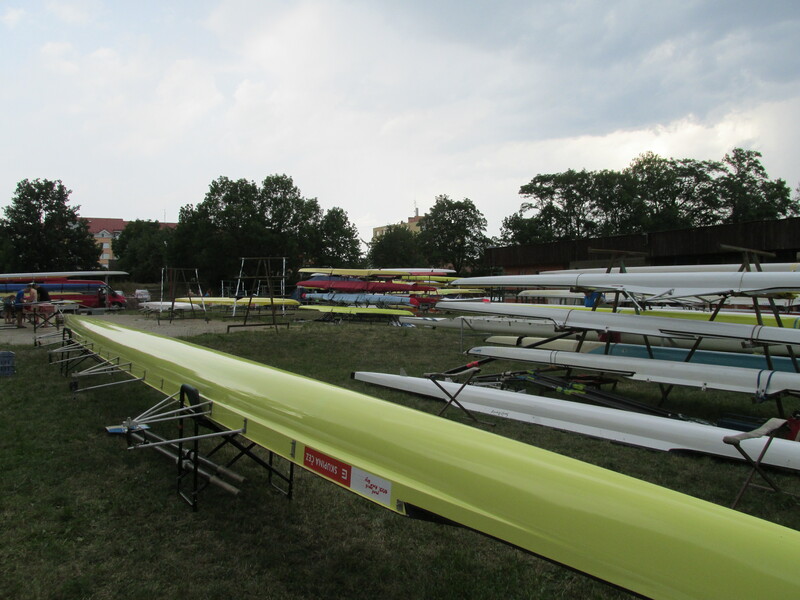 One of the practice starts was rowed under distant lightning and thunder, which may sound interesting and exciting, but it is slightly scary as well. Hopefully, with the crosswind, the thunderstorm would not come near us. Five minutes before the start time it started to rain. A few drops first. Big drops though. Then the rain density increased. Soon, it was a true, heavy downpour. The kind of rain where you see the drops hitting the water surface and creating a splash of a few centimers high. In the 2 minutes remaining to the start we were soaked. Stroking the quad, I had a very special experience during the first stroke. It seemed to happen in slow motion. At the “row” command I started to pull our first swelling, controlled half slide stroke, I heard the whooshing sound of the first stroke of all six quads and I just couldn’t help but enjoy it. Wow! I thought. This is it. This is why we row. After that moment of joy, there was business to take care off. 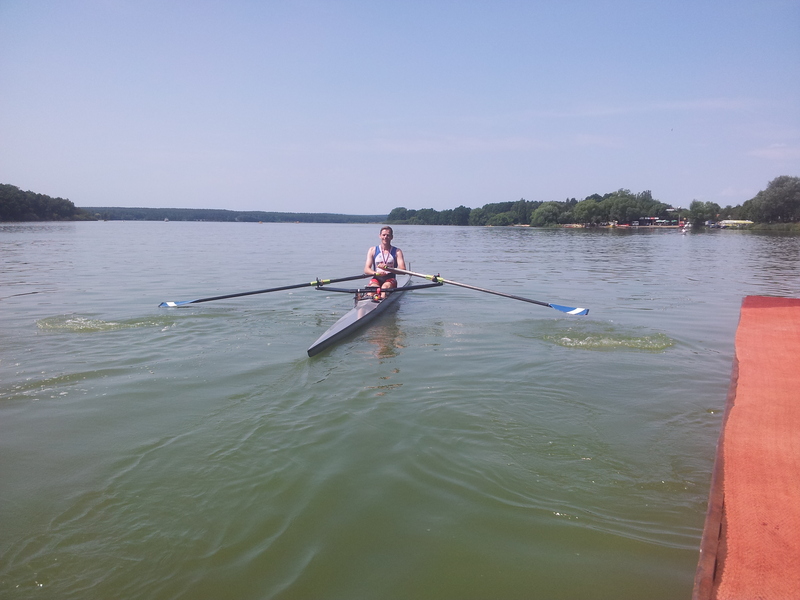 I had instructed my quad to row very focused, eyes in the boat, in the first 500m, and I followed my own instructions. There was only our own quad, CrewNerd and the rudder. I needed to steer a straight course! After the start and a few strokes I checked the stroke rate. Tried to settle. Settled for 38spm. Too much adrenalin. 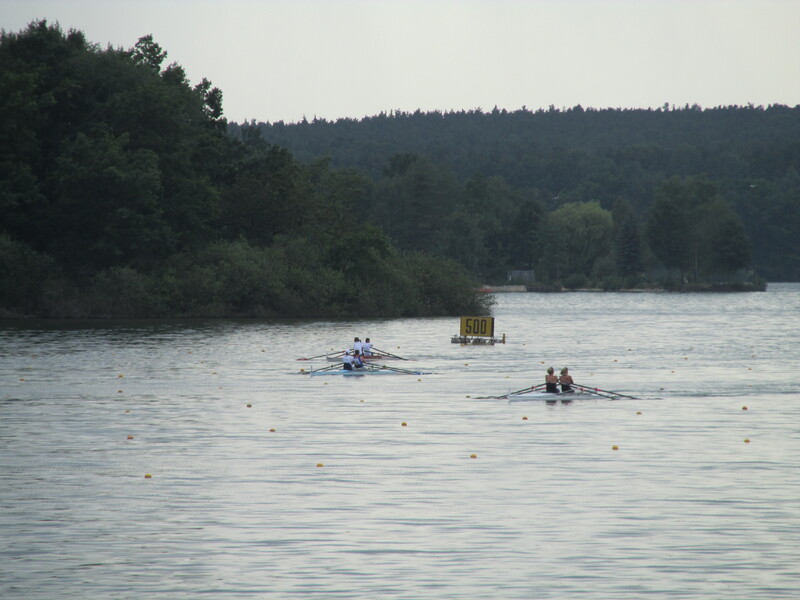 After about 200m my field of fiew featured a few boats and I concluded we were leading. I focused on the boat closest to us, Blesk from Prague, two lanes to my left. We were rowing away from them. Cool, I thought. We are in a leading position. At 600m to go, however, the dream ended. This is when I started to realize that something was wrong. There were only 4 boats behind me. Neratovice, directly to our right in lane 3, must be ahead of us. A quick glance. Yes, there they were. Two boat lengths ahead of us. Our bow man was supposed to give the call for the final sprint, somewhere between 500m to go and 300m to go. He gave it with 300m to go. Later he told me he was too exhausted to dare to call earlier. I understand that. After the singles race, my legs were jelly at the half way point as well. Anyway, we were doing a “leisurely” 36spm at that point (remember we had difficulty getting above 34spm in our trainings) and I increased the stroke rate to 38spm. Still in the heavy rain. Blesk was still two boat lengths behind us. Somewhere around 200m to go we had reduced the margin to about just over a boat length. Martin, in 2 seat, nearly caught a crab but managed to keep hold of his handle. However, he caused an imbalance that made me slap my blade on the water. I couldn’t hold of my right hand scull’s handle. Damn! Stupid rain and very slippery handles. We were very lucky our Wintech quad doesn’t have forestays. 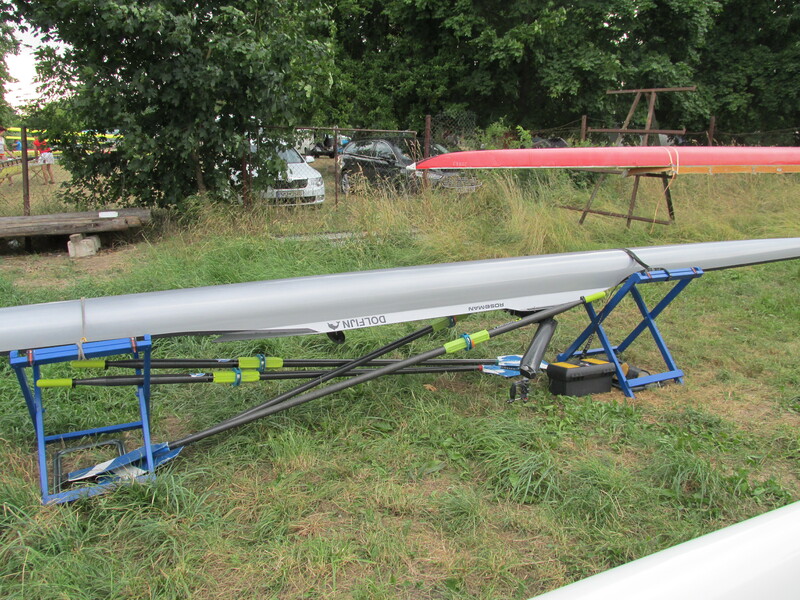 The scull did a 360 degree rotation around the oarlock pin. The blade disappeared under our hull, then surfaced again. In slow motion, I saw the handle approach me. All this in a heavily shaking boat, as our two bow men tried to row on while Ondra on three couldn’t row and I had just one scull. I managed to grab it. Ondra called “We still have silver!” and we started to sprint for the line. I think we exceeded ourselves and despite the crab I am happy with the result. Close enough to 3 minutes in neutral conditions. Faster than we have ever rowed. Holding 37spm average in heavy rain. The medal ceremony was done in heavy rain at double the speed. The poor girls in their pretty dresses were soaking wet and cold. We weren’t cold. Actually, getting the shower during the race is quite refreshing. So two silver medals. Happy with that! Is that the end of a good first day of the Championships? No. Then we met some more Masters rowers and we all went to the Historical Brewery, where there were masses of Masters rowers and we had a few beers. Then we watched the fireworks over the island behind the finish line at 11pm. Then we went to bed but the hotel room was too hot to sleep even though we had all three windows wide open (no airco) and there were drunk people discussing loudly in the hotel courtyard. Ideal race preparation for my two races on Sunday, the Men’s Masters B 2x and the Mixed Masters C 2x. More about that in part three of this blog. I am late with my race report on the Czech Masters Open. Apologies for that. I spent the weekend offline, racing, interacting the people there and enjoying the atmosphere. Back in the office, there is a lot going on and I need to prioritize between getting my job done, my family, my training and the blog writing. The online audience just had to wait. But don’t worry. There will be a race report. I plan to write it in three parts: Friday, Saturday, and Sunday. No historical brewery there. 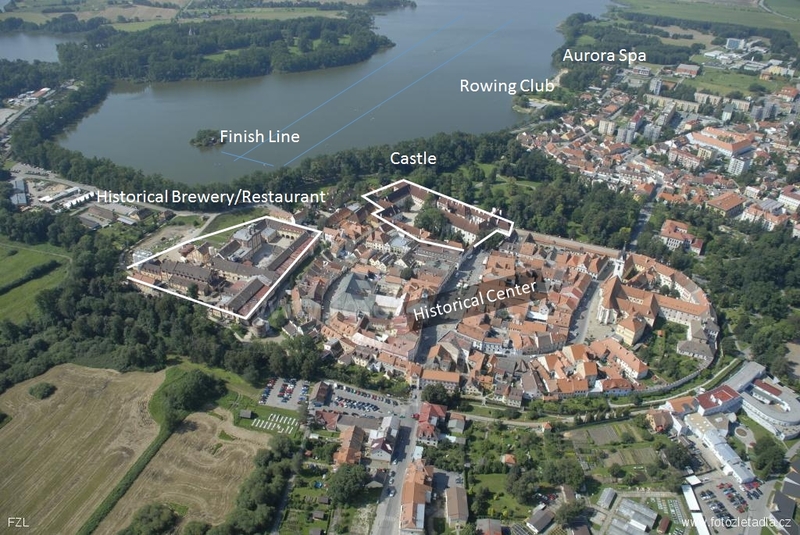 A chemical factory and a communist 1970s factory town, yes, but no historical center with a castle or a brewery. Perhaps more FISA compliant, but Not Good for Masters Rowers. 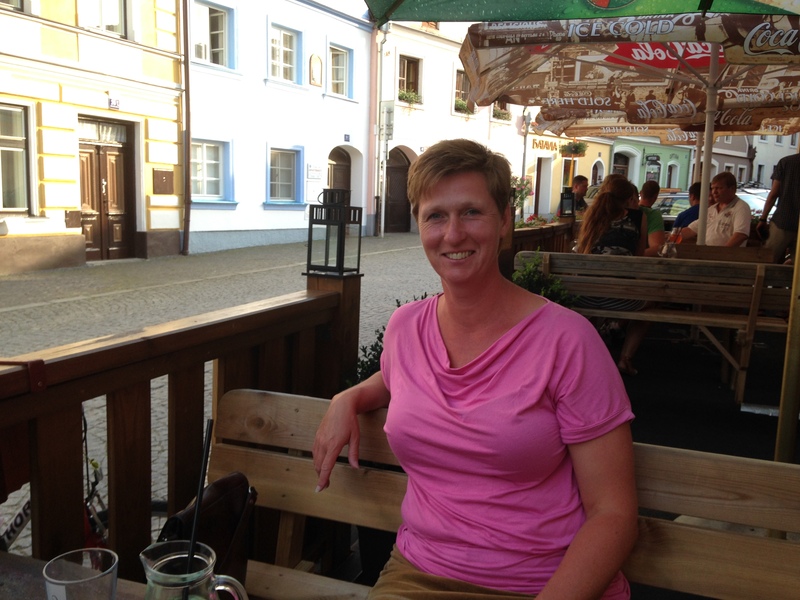 So the atmosphere and the large Masters Rowers community were enough to attract a few foreign participants from Germany, France, Austria, and … Australia! So on Friday Romana and I did the 2.5 hour drive to Třeboň, checked in to the hotel, waited for the trailer to arrive, and I rigged the single. Then I did a leisurely 6km row, with a few test starts and 10 stroke intervals at race pace. Followed a dinner with the ladies that Romana rows with, and then to bed early. Saturday morning: the Men Masters C 1x Singles!!! !